The Edinburgh and Norway teams on parade at Powderhall on 7/8/81. 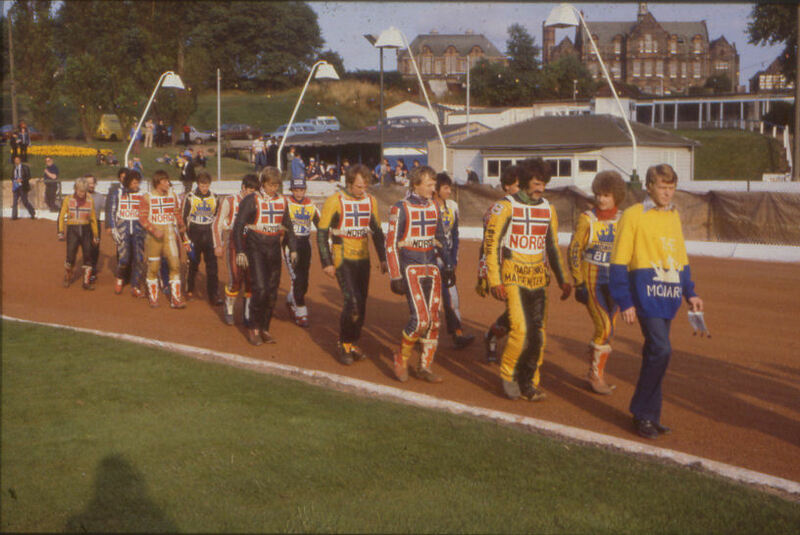 The Norwegians are led out by their team manager, the former Monarchs' great Reidar Eide (wearing a Monarchs' jumper loaned by Alastair Lonie which was a few sizes too big). Monarchs' fielded a weakened team with Chris Turner and Ivan Blacka not racing, giving a chance to Peter Erskine who can be seen near the back of the Monarchs lineup. This shot is also a nice reminder of the pits end of Powderhall in the stadium's heyday.